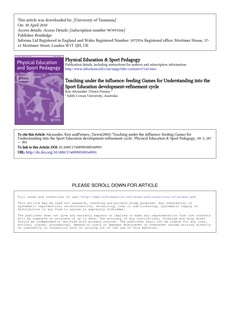 In this contribution to the special issue on Teaching Games for Understanding (TGfU), we outline how the Sport Education curriculum model constitutes an organisational framework within which a TGfU pedagogy might productively be located and utilised. In addition, we describe our application of the development-refinement process to the progress of Sport Education in an outcomes-based educational environment. This has led to a new relationship between Sport Education and TGfU within what we call the 'Clinic-Game Day' (CGD) model. Included are two tables depicting typical Clinic and Game-Day instructional formats. We conclude by foregrounding a number of workplace factors that may affect the adoption of the CGD.